I was going to make these a few weeks ago after seeing the recipe in June’s Good Food magazine and never got round it. Mr Birdie and I celebrate our 11 year anniversary this weekend (not sure where that time has gone – I’m sure it’s only yesterday I was at university) and as I’ve been on half term this week (meaning I had the time to make the dough) I decided it was a good opportunity to make something special for our breakfast. 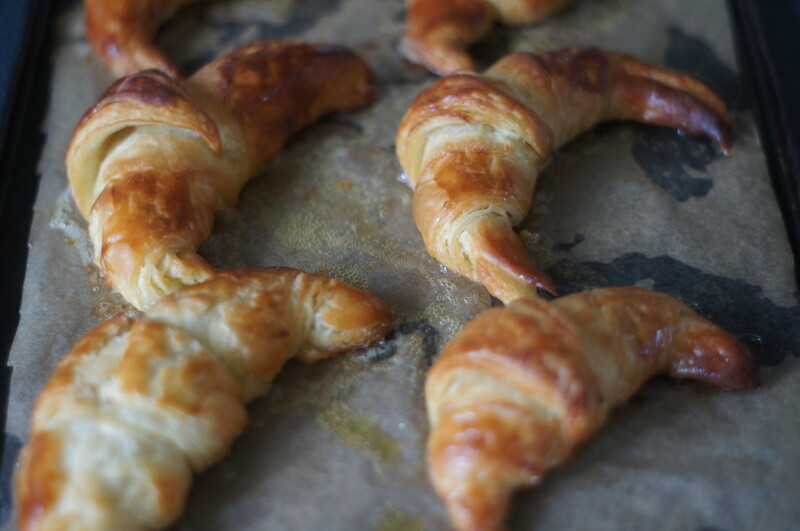 These croissants are a labour of love! You need to allow plenty of time – don’t think you can whip these up in a couple of hours. You will need to chill the dough overnight and then they need 2 hours resting time after they’re made and shaped. Although I’ve made rough puff pastry before this was the first time I’d attempted anything like this. This is a bit of a belated post as I made these about 3 weeks ago. I always seem to have some overripe bananas hanging around as I’m not a fan of them when they start to go brown on the outside. This means I’m always on the lookout for recipes that will use them up. I spotted this recipe on Pinterest a couple of months ago and decided to give it a go as I had all the ingredients already. Chocolate and banana is a combination that can’t go wrong and if you add an oaty topping you can almost believe they’re good for you! I think these would be great for brunch but they will work just as well at any other time of the day with a cup of tea or coffee. 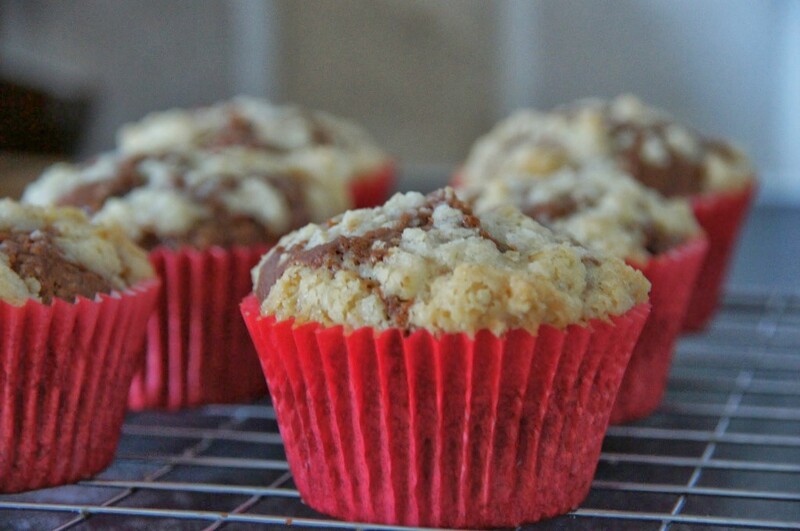 This recipe will make 8 muffins. As it is an American recipe the measurements are in cups. With hindsight after tasting these I think you could probably up the amount of banana as when I tried one the banana isn’t that strong so if you like a stronger banana flavour maybe try adding two bananas. Today was the baptism of the son of one of my best friends – the extremely cute Ellis. Knowing my love of baking my friend Rachael asked if I would make a cake for after the service. It was the perfect opportunity to try something new. 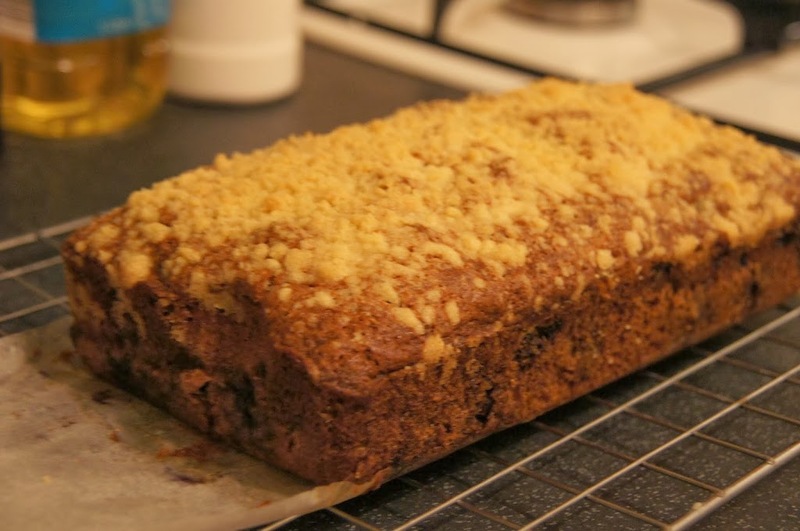 I had some blueberries that needed using up so I decided to try out this recipe for Jo Wheatley’s blueberry muffin loaf. This is a lovely, moist, fruity cake with the added bonus of a crumble topping. Jo recommends serving it warm for brunch but I think it would go down well at any time of day. The recipe comes from ‘A Passion for Baking’ but you can find it online here.